Only eight months on from her FIFA U-20 Women’s World Cup debut, Papua New Guinea’s Nicollete Ageva is back on the international field at the OFC U-19 Women’s Championship 2017, and the famous goal scorer is still spreading the same important message. “Nothing is impossible for women,” she said. Ageva and the Papua New Guinea U-20 women’s team were part of the large group of ambassadors endorsing the #ENDviolence campaign throughout the World Cup, and after seeing its effect on her home nation, Ageva is pleased to see the campaign continuing in OFC competitions. “I think the campaign made a positive impact on the women’s game in Papua New Guinea,” she said. “It was a good campaign for PNG. It really pushed women to come out of their comfort zones. They can now see that women can do what men can do. Since her experience at the World Cup, learning under coach Lisa Cole and assistant coach Rachel Wadunah – who is currently at the helm of the team for their France 2018 qualification campaign in Auckland – Ageva has been inspired to also become a positive role model for young girls. “The World Cup was very challenging because it was my first time to play in front of big crowds. I was really nervous but coach Lisa and coach Rachel used to push us with encouragement. They supported me and pushed me to overcome those challenges,” she said. Although Ageva expected to return back to her normal life following the World Cup, her team’s impressive performances – and Ageva’s historic goal – has given the 19-year-old celebrity status back in her province. “After the world cup I went back to my home province and back to school. Everyone was really proud of me and excited and very happy to see me again in my province. They welcomed me like I was a famous woman,” she said. 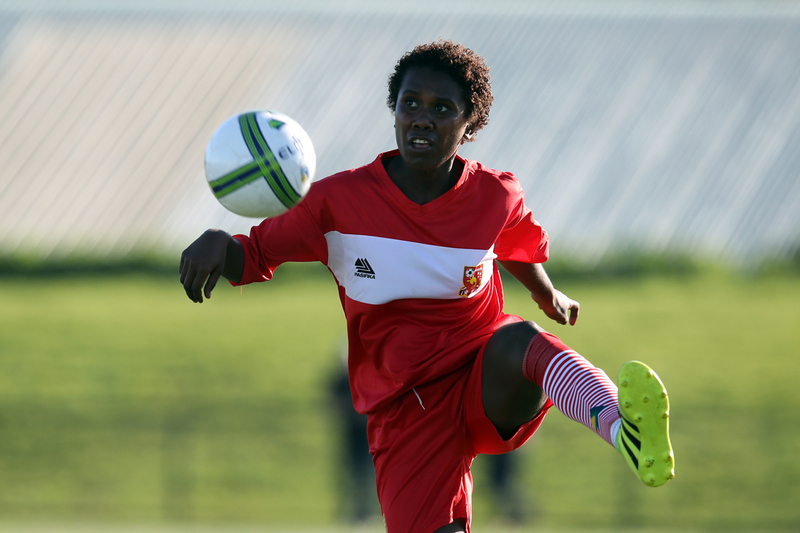 Ageva has put the new-found fame to good use during her time back home, filling her free time training and encouraging aspiring female footballers. “In my free time I was training children in small-sided games and helping out in the local football competition in Bougainville,” she said. “My favourite thing is to go out in my province or in other parts of Papua New Guinea and help little girls to come out and play. With her focus now on tomorrow’s match against New Caledonia, Ageva knows that all eyes will be on Papua New Guinea as they fight for their first points of the competition, but after conquering the mountains she has faced over the past year, Ageva in a calm, positive mind set ahead of the clash. New Caledonia will play Papua New Guinea on the second day of action at the OFC U-19 Women’s Championship 2017 at Ngahue Reserve in Auckland, New Zealand at 12:30pm tomorrow (local time).